Buying gold in 1 oz RMC Gold Bars is a great way to own gold at low gold bar prices due to its low gold bullion premium. This 1 oz Gold Bar produced by Republic Metals Corporation (RMC) is .9999 pure gold bullion. Refined and manufactured completely on-site at RMC’s southern Florida (USA) gold refinery, this well-crafted 1 oz gold bullion bar design features the RMC logo and is stamped with its guaranteed gold bullion weight and fine gold bullion purity. Each 1 oz RMC Gold Bullion Bar has an individualized serial number for security and record keeping. The back of these low premium 1 oz gold ingots bears a repetitive motif of the Republic Metals Corporation (RMC) logo. This 1 oz gold ingot is priced to allow gold investors access to small increments of recognized gold bullion bar products to add both flexibility and diversify to their gold investment portfolios. All 1 oz RMC Gold Bars are eligible for holding within Individual Retirement Accounts ( Gold IRA) or Retirement Savings Plans ( Gold RSP ) respectively. You can store your 1 oz Gold RMC Bar safely and securely with Kitco Allocated Storage. Kitco offers global options for gold bullion storage that are fully segregated, insured and allocated. Kitco's network of top-tier gold vaults include some of the most secure storage facilities located in Canada, Hong Kong or the United States (COMEX approved). Cayman Islands gold bar storage is also available (certain conditions apply). Find out more about keeping your gold bar purchases secure, with our Global Precious Metals Storage Solutions. Republic Metals Corporation (RMC) is a globally recognized full-service precious metals refinery. Holding listings on the London Bullion Market Association (LBMA), the Chicago Mercantile Exchange (CME Group) and the Shanghai Gold Exchange (SGE), Republic Metals offers a broad range of gold ingots and gold bullion items for the savvy gold bullion buyer. Why buy RMC 1 oz Gold Bars from Kitco? 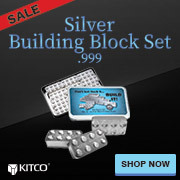 Kitco is a highly trusted leader in the gold bullion bar and physical precious metals industry. Gold and other precious metals sold by Kitco are recognized in gold bullion markets around the world. With our focus on gold bars and gold bullion, you can benefit from our low gold prices and premiums that are highly competitive in the gold bullion industry. At Kitco, we make it easy for you to manage your tangible wealth. You can sell or buy gold and other precious metals using our convenient online store, or by contacting our team of highly trained precious metals specialists. Backed by our global information network, Kitco has proudly served our customers since 1977. The RMC 1 oz Gold Bar(s) you receive may not be in mint condition.